I took a few pictures of the process. 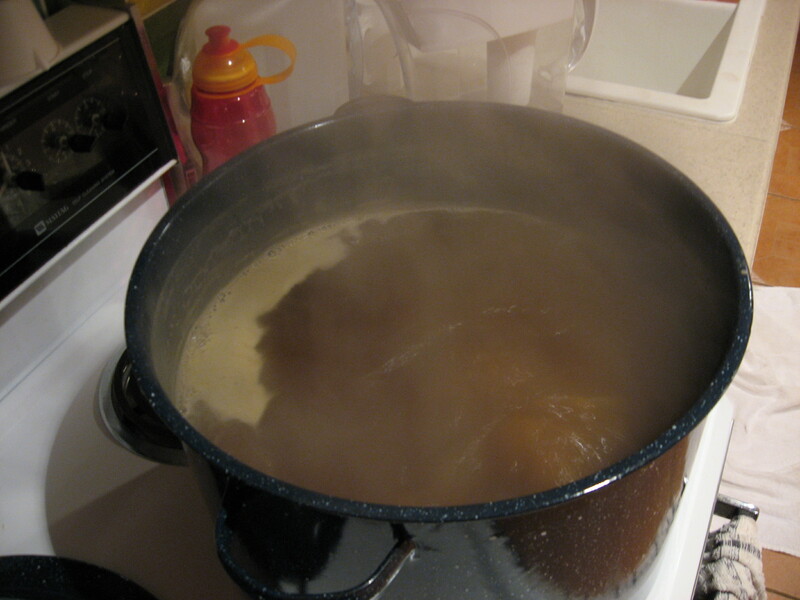 One picture is of the boiling wort (malt extract). 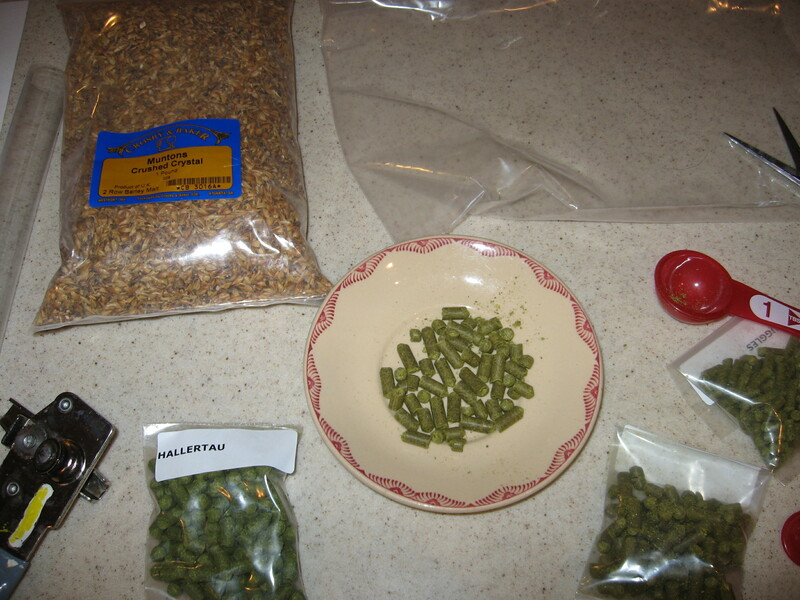 Other pic is of the hops in pellet form. Hops really smell like bud. I'm working on getting into brewing myself. A friend of mine in the town I live in has hired a professional brewer (with a degree in beer brewing from UC Davis!) to help him open a brewpub, which has been his dream for 30 years. I'll be doing some of the carpentry for the pub, among other things. This means that within a few months, I'll be able to ask an expert with over 15 years of professional brewing experience anything I need to know. Likewise, I'd be happy to relay any questions anyone else has to the Brewmeister. One thing I've already learned is that for consistent beer, that is consistency among different batches, you need to maintain your own yeast culture. This isn't so important for a hobby homebrewer (variety is usually more interesting) but I immediately realized how some of the mushroom growing technology might be useful for this... like a modified LC for beer yeast for example, or using a laminar flow bench for certain steps, etc. Hope yours turns out drinkable! I'm more of a mead brewer myself, but I've got a couple of batches of beer under my belt. Care to share your recipe, procedures? Once you taste that first bottle of fresh beer, you will definitely be hooked on homebrewing! is boiled on the stove in a saucepan for about 15 minutes. While that is cooling, take about 1/8 cup of warm (not hot) water and pour your packet of dried yeast directly on top. Do not mix at this point. After about 10 minutes, swirl the container to suspend the yeast. This ensures that the yeast is properly hydrated. After your honey and water mix is cool, pour it into the bottle with a funnel and add your yeast slurry (should be starting to foam by now). Shake the bottle well with your finger over the top to dissolve some oxygen. Add a piece of tinfoil over the top and place in a warm spot (over a pan is good, because sometimes the foam can get out of hand). Leave this for at least 24 hours and pitch to your cooled wort or must when ready. Sorry, didn't mean to hijack your thread there! You're gonna have some fun, Sharkie. Homemade beer is (usually) great. Once you get a couple of batches under your belt, it gets much easier, less messy, and more fun. Now, bottling is another story.... hehe. I always seem to spill some of that sticky juice on the floor. It's been a few years since I brewed -big houseful of people isn't conducive to such activities- but maybe soon... A case or 2 of good homebrew makes you popular at parties. By the way, that sounds like a good technique, Strangegem. I've always pitched the yeast dry with no problems, but when I start up again I'll give it a try. Yeah, I don't like to add sulfites or other chemicals preferring a more natural product, so the yeast starter is good insurance that your batch won't go sour on ya. Well for my 1st batch I used 6lbs of Muntons English Amber malt extract boiled in 3 gallons of water. I then added 3tbs of Fuggles hops 15 minutes in and boiled for another 45 min. I then finished by adding 3tbs of cascade hops let boil for 15 more minutes. I then cooled in the bathtub full of ice but I didn't have enough Ice so it took longer than is normal. I had a yeast starter waiting to pitch. When the wort got down to 80 degrees in it went. All went into the fermenter and this morning I woke to the sound of a bubbling airlock. I guess I'm on my way hopefully. Sounds good. What kind of yeast did you use? My friends brew there own beer. They working on brewing it up with weed in it. so far it was too damn strong and got sick. Sounds tasty. Don'tcha just love that bubbling sound? I once did some reefer brew. A dark stout. I just threw a bunch of trimmings into the wort, like a finishing hop, and let them stay in through the first fermentation. Strained 'em out when I racked to secondary. It tasted all right -a bit 'weedy'- but didn't seem to have a whole lot of reeferian activity. A friend, however, liked it well enough to trade lobsters for it, one lobster per bottle. YUM! I used Muntons yeast two packets. Weed in it ay? I never thought of that. I think that there's a hemp beer out there. flex in either direction too much or you will end up with off flavors. would the hemp seeds just make it taste like weed? my friends were using lots of dank buds in theres than strain them out after its cooked. ill see if they got a recipe or if they just making there own. It wasn't seeds, it was the trimmings off a bunch of buds. No magic in seeds 'n' stems. The book "The Complete Joy of Homebrewing" by Charles Papazian is an indispensible resource for homebrewing - one of the best out there. The biggest trick is staying clean. You don't sterilize like you do with mushie growing, but rather just get things sanatized to reduce any wild yeasts/bacteria while your brewing yeast gets a foot hold. So if you stayed clean, you'll probably be fine. And although there's a bunch of fancy ways to cool the wort, I usually just fill my sink about 3/4 of the way with ice water, and then put the pot in there. I just stir and add more ice to the batch if necessary for about 15 minutes and I can get it down from boiling to 80 F.
As far as yeast goes, I've used dried packets a couple times, but I really like the liquid yeast like White Labs. They're more expensive - around $6 per tube compared to the sub-$1 dry-packet cost, but it's a cheap $5 insurance if you don't want to go through the hastle of creating the yeast culture when you're throwing $30 in other ingredients. I hope your beer turns out great - I've loved making my brews. I use to brew. I have done many types. I started brewing with extracts and slowly built up my equipment to do grain based worts. Your cooling experience is a problem. I sort of solved it by preparing ice. I would pour the hot wort over the ice to cool it. The extract wort had to be boiled as a high gravity one. Several problems though. Ice could contaminate the brew being one. Eventually I made a heat exchanger to use tap water to cool the wort as it was siphoned from the brew kettle to fermenter. Yeast is best rehydrated first with water. Then introduced into a quart of wort saved from a previous batch. Do this 2 days before you brew. You will have a large batch of yeast ready to inoculate the main batch. Only one package of yeast is needed. The quart of yeast will smell like apple juice. Once fermentation starts the process must remain anaerobic. When transferring the brew from the primary fermenter to the secondary it is important that vitamin C is added. A 1/2 teaspoon is good. Anytime the brew is handled, which should be minimal, add vitamin C. This will prevent oxidation, and will make a brew that tastes like the real thing. That is a start from me, I am too long winded. Ask me anything at all. I won a 2nd place ribbon at a county fair a long time ago once. Never heard about the vitamin c thing but I'll try it next time. I just transfered my wort to the secondary fermentor today and it smelled like beer. It's sitting in a glass carboy in my closet now. Not sure though how long it needs to be in there. I was thinking 3 weeks before I bottle. hey sharkie do you still have the air lock on the carboy?